Mitsubishi Electric Hydronics & IT Cooling Systems, through its brand Climaveneta, has supplied the HVAC system to the Casa di Cura Montevergine S.p.A. in Mercogliano, a private clinic specialized in cardiovascular diseases. The hospital is located in a hilly area in the historic town of Mercogliano, a well-known climatic small town in Irpinia, not far from the city center of Avellino. The complex has 120 beds and consists of a main building, divided into 4 levels with a total internal surface area of 5,700 sqm dedicated to health activities and a secondary building, where the Administrative Offices, the Medical Management and support works offices are located. A green area of approximately 7,000 sqm equipped with a garden and two large parking lots complete the block, built in the second half of the '60s. In 2017, for the second consecutive year, Montevergine S.p.A. ranked third in the best clinics in Italy in terms of number and quality of surgical procedures. This is the result of a continuous investment in technological innovation, training of professionals, and work organization, which has enabled Montevergine to become a national excellence. The clinic is technologically advanced even from a MEEB (Mechanical and Electrical Equipment for Buildings) point of view, thanks to the renovation of the HVAC system. The progressive efficiency reduction of existing chillers on one side and the need to optimize the energy performance of the whole building on the other side, led to the installation of a new HVAC system to meet the new demands. The use of the buildings and the characteristics of the existing systems, along with the objective to grant high energy performance without affecting the internal comfort, led to the choice of air cooled chillers. The HVAC plant designer therefore chose 2 Climaveneta TECS XL CA 0512 high efficiency chillers, air source for outdoor installation in super low noise version, featuring oil-free centrifugal compressors with magnetic levitation. The choice of chillers featuring magnetic levitation compressors was made to grant high efficiency, reliability, and low noise emissions of the HVAC system. The installation of this high efficiency (Class A) air source chiller led to an energy consumption reduction, as they easily adapt themselves to different thermal load conditions thanks to the precise thermoregulation together with the use of inverter technology, and this also led to a running costs reduction. Each chiller supplies, under project conditions, approximately 525 kW with an outside temperature of 35 ° C. The HVAC plant designer, talking about the project says: ‘’The air conditioning system is managed by a BMS. To maximize the energy efficiency of the system, thus reducing the clinic’s running costs, the system independently sets chillers switching on and off, on the basis of the real building’s needs. In addition to the high energy efficiency achieved, the plant fully meets the customer's needs in terms of reduced noise levels, to avoid any obstacle to the delicate activities taking place inside the building, and any concern to the patients of the Clinic”. In healthcare facilities the HVAC system has an essential role not only in guaranteeing the well-being of patients, but also and above all, in supporting medical activities. 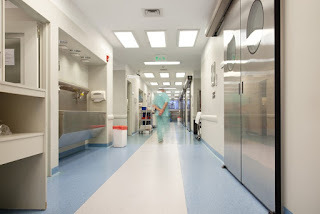 Since medical activities are carried out throughout the day and all year round, the air conditioning units must be reliable and with an easy service to minimize any possible interference with the indoor activities. The reliability of Climaveneta units and the flexibility of their operation make the HVAC system easy both in terms of installation and maintenance.